Unbelievable how one moment can affect your whole life. One minute, I’m in a little place called Buras, Louisiana, realizing how great life can be. Seemingly the next, WHAM my whole world changed. And somehow I find myself really wondering what to do about it. You see, that moment of bliss in Buras actually happened almost exactly one year ago. We were on our yearly choir tour/mission trip with my youth. That trip had been marvelous: our bus driver was very self-sufficient and extremely kind to the youth and to me; we had FINALLY gotten a trip where we were on the bus the whole trip with our best friend youth group from another town; I hadn’t had a single report of “mean girl” bullying that day, and it had just been a pleasant trip all around. We had done community work that day: some painted, others moved pallets of sheetrock, still others built a HUGE wheelchair ramp, and others even still went to the community center to do arts and crafts with kids from the area. That night, the youth gave a very moving performance wherein they were so overcome by the hugeness of God’s Grace and the power of His Spirit, we had to stop, exit the stage, breathe, pray, and regroup before they could continue. The combination of hard work, laughter, prayer, and gracious people, really just culminated as they were singing. It was a powerful witness. Later that night, we had a huge candle circle, and a whole lot of talking worked out personal fears, inner ghosts, interpersonal relationship issues, and a feeling of calm came over us all. We were with God. And life was so good. The picture above was taken in the Sanctuary after everyone had gone to bed. 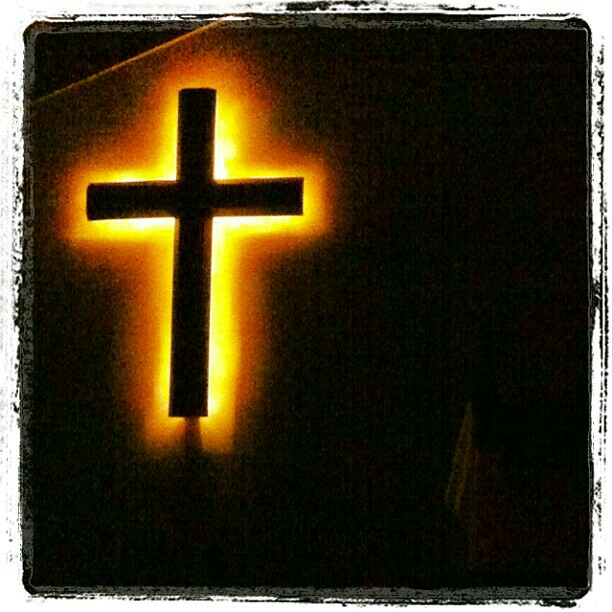 The light behind that cross is always on, and this picture will always represent that moment of my realizing the overwhelming love that I KNOW is given to me, as well as a memory of a great day. But in the year since that moment, so many things have changed. While I am loving being back in design, it’s my sad news to report that my time in youth ministry has come to an end. Circumstances took my being at the church full-time down to a part-time position. And although my senior pastor did much to keep me on as PT Youth Director while I also worked full-time in design, it simply wasn’t to be. My girlies missed me and – in their own baby-girl way – they started to resent the church always keeping me busy. With heavy heart, I had to step down and leave the youth I loved so dearly. But now, I’ve got a whole future awaiting me, one with art and laughter and bouncy curly blonde hair and silly songs and an insane amount of love. This is a wonderful time in my life. Yet somewhere in my heart, I will always be drawn back to that moment in Buras, and how significant it truly was. What is it trying to tell me?! One moment really can change your whole life, can’t it? Posted by Tracey on June 19, 2013 in Heart, Life, Work and tagged cross, life, youth ministry.